Eastern Oregon Film Festival will be celebrating our seventh annual program October 20-22. We have been busy locking in another great program of independent film, music, and conversations to present in historic downtown La Grande. Eastern Oregon University has stepped forward this year as a presenting sponsor. EOU will provide a venue and resources to help reach students and staff while enhancing the festival footprint. Homecoming festivities and the film festival will coincide this year adding extra buzz in the community. There will be plenty of opportunities to engage with EOU students, alumni, faculty and staff. EOFF is excited to announce that the 2016 EOU Distinguished Alumni Skye Fitzgerald will be attending the festival this year! 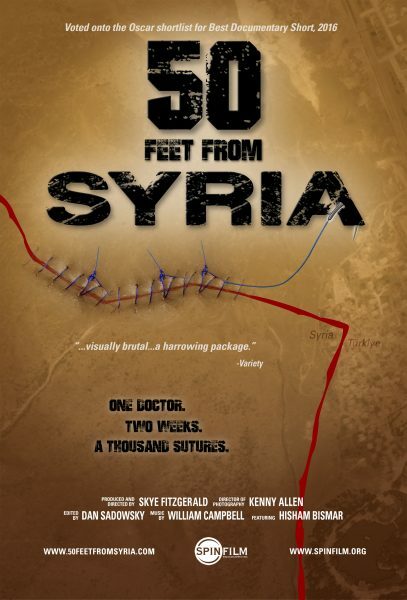 He will share his most recent film “50 Feet From Syria” as part of the EOFF @ EOU program. 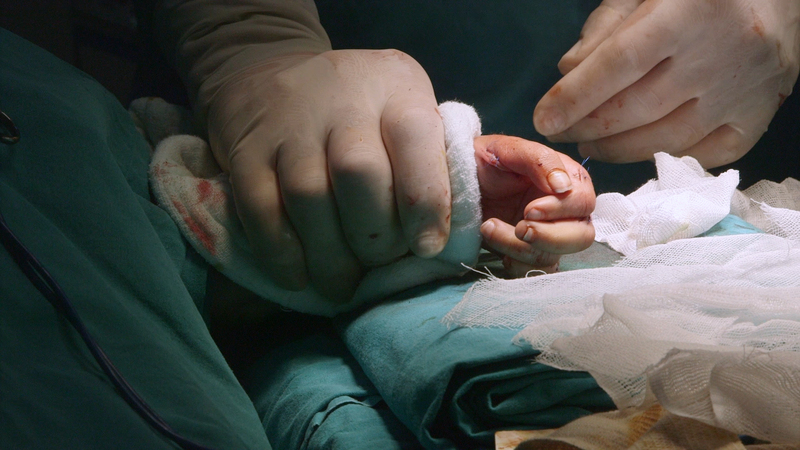 50 Feet From Syria is a portrait of surgeon Hisham Bismar as he delivers life-saving medical care undeterred by the chaos and complexity of war around him. The film serves as a snapshot in time of the plight of refugees displaced by the Syrian uprising. It indelibly communicates the human cost of one of most brutal, dehumanizing conflicts in modern history that continues to destroy and displace millions of lives. Fitzgerald graduated from EOU with a Bachelor of Arts (BA) in Theatre Arts minor in English/Writing where he went on to pursue a MFA in Directing from University of Oregon. Fitzgerald has produced projects focused on human rights and social justice issues since 1998. Along the way he has collaborated or received support from the Sundance Institute, the U.S. Institute of Peace, the State Department and the Paul Robeson Fund, including being named a Fulbright Research Scholar to produce the film Bombhunters. Reviewers have characterized Fitzgerald’s work as “emotional and artful…deserves considerable exposure” & “…visually brutal” (Variety), as “an infuriating study in the ways that power greases the wheels of justice” (LA Weekly), and noted that it “confronts us with injustice” (Voice of America). As a Director of Photography, Fitzgerald has lensed work for Dateline NBC, CNN, Discovery Channel, Mercy Corps, VICE NEWS, Travel Channel, History Channel, Weinstein Company, ABC, MSNBC, NHK, Kaiser Permanente and the Portland Trailblazers. Fitzgerald will engage with classes as well as participate in EOU alumni celebrations during homecoming. For more information on EOU’s homecoming events visit eou.edu/alumni/homecoming/. EOFF will again host its festival HQ in historic downtown La Grande and host a variety of filmmakers, musical guests, and conversations, with a great selection of locally crafted brews to wash it all down. Films will be screened at The Granada Theatre and The Liberty Theatre Foundation’s Stage Door Theatre in addition to the on-campus EOU venue. Prior to festival weekend, EOFF will present a segment at Baker City’s ‘We Like Em Short’ film festival Saturday, August 20th. EOFF will also be supporting a screening of ‘City Girl’ with original score performed by The Oregon East Symphony in Pendleton on October 1st at the Vert Auditorium. Official festival passes and full program details will be announced September 21st at the annual sneak peek, pass sale, and fundraiser event. More information on this energizing event coming soon. EOFF looks forward to a strong and sustainable future. The organization is supported by a membership base and business community that cares deeply about culture, and values the impact it has on our downtown’s economics. The festival is made possible by individuals, businesses, and organizations who support EOFF’s mission, and love to participate in one of Eastern Oregon’s most notable cultural events. Become a member or sponsor today! Keep an eye on our social media streams like Facebook, Twitter, and Instagram for breaking news on programming and events. For more information please contact Christopher Jennings, EOFF Board President and festival director at director@eofilmfest.com or 541-962-5799. Previous #EOFF2016 is in the works!